Intel employees use a variety of devices during the day to get their work done. We’ve developed a way to let them access the same information on whatever device or user workspace they choose to use. 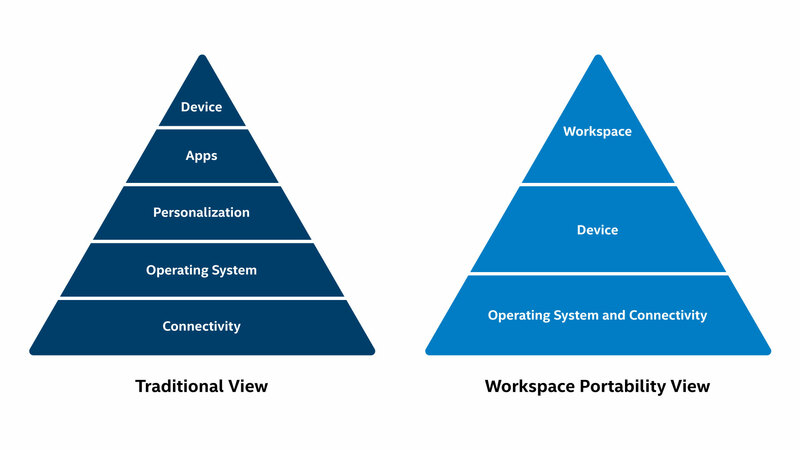 As part of our workplace transformation vision, Intel IT has developed a reference architecture for decoupling the user workspace – user content, applications, and personal settings – from the OS and hardware. This reference architecture for workspace portability will help us substantially increase IT efficiency as well as end-user productivity. We want to turn the traditional view of the user experience stack upside down. Traditionally, the device is considered the pinnacle of the stack, whereas we consider the workspace the pinnacle of that stack. 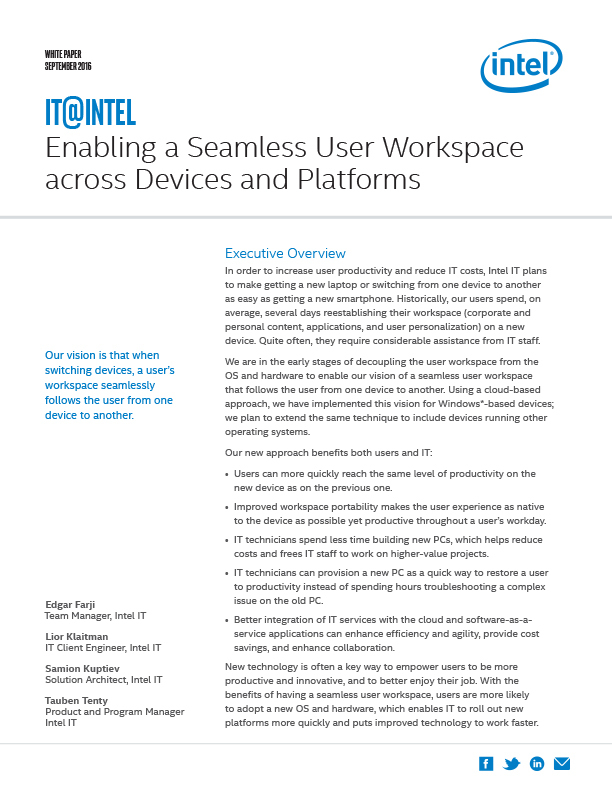 With our seamless-workspace reference architecture, it won’t matter what sort of device is in use. For example, it could be a laptop, a tablet, or a smartphone. Whatever the device, as the user switches from one to the other, the workspace moves too. This means that users will be able to accomplish the same tasks with continuity from device to device, with the same personal settings (where applicable), and the same content (both corporate and personal) on all their devices. The application might not be exactly the same, depending on the device type, because we are committed to providing as native an experience as possible on each device. But the functionality will be the same. For example, if the user is editing page 5 of a document on a laptop and then switches to a tablet, that same document will open to page 5 and be ready to edit (although the word processing application might be different). The result is that the type of device and OS will become almost irrelevant – the workspace follows users from device to device, making their life easier and their worktime more productive. We’ve begun with the simplest use case: Windows device to Windows device. But as we move forward with our vision, we will extend workspace portability to all device types currently in use at Intel eventually including edge devices connected to the Internet of Things (IoT). In fact, as the IoT becomes ubiquitous not only across Intel but across virtually every aspect of users’ lives, it becomes imperative that the user workspace be liberated from the device trappings and become its own independent entity. The core of our workspace portability reference architecture is a workspace agent. This agent captures the device state (apps that are open, location in the document, and more) and then makes that same state accessible to all authorized devices by storing it in an orchestration layer in the cloud. Each device has access to that orchestration layer and can apply it differently depending on the device type. This results in a seamless workspace yet retains the device-native user experience. For example, editing a document on device A may use one application, while editing that same document on device B may require a different application. And yet, as users cross the boundaries between devices, they can pick up where right where they left off. Porting the workspace between significantly different devices, of course, is fairly complex. For example, the workspace agent separates delivery of services, depending on whether they are Web-based, native, or hybrid. We also need to work with Intel’s application developers so that applications can make their personal settings available to the agent. Eventually, we intend to integrate “know me” aspects into the workspace agent (through machine learning algorithms), so that the agent can deduce context and provide even more productivity benefits to users. For example, if a user switches to a smartphone and has already accessed a conference-scheduling application, the agent might deduce that the user will soon be attending a meeting and offer to open a note-taking application. We will derive the most immediate value from workspace portability during our PC refresh process. By decoupling the workspace from the OS and hardware, IT technicians will no longer be required to provision the new PCs, and users will no longer need to spend up to two days attempting to recreate their workspace, manually migrating data, reinstalling software, and reapplying settings. Instead, new PCs will be able to be provisioned through a vending machine-type solution with minimal IT touch and maximum user productivity. New technology is often key to empowering users to be more productive, enjoy their job more, and be innovative. With the benefits of having a seamless user workspace, users are more likely to adopt a new OS and hardware, which enables IT to roll out new platforms more quickly and puts improved technology to work faster. 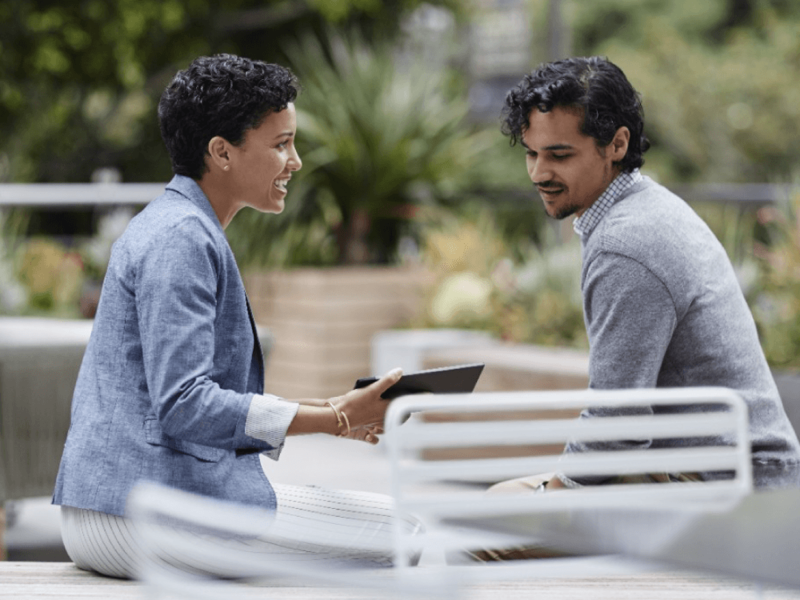 We are excited about the future of workspace portability and how it will enable users to remain productive across multiple devices, switch between their work persona and personal persona with ease, and access a growing number of cloud environments and services. 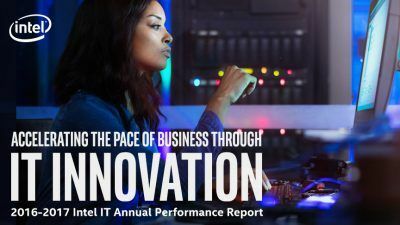 Read the IT@Intel white paper “Enabling a Seamless User Workspace across Devices and Platforms” as well as our recently published 2016-2017 Intel IT Annual Performance Report, “Accelerating the Pace of Business through IT Innovation,” for more information about how Intel IT is transforming Intel and creating business value. On the staff of Intel’s IT Client Engineering team, Tauben Tenty is the Program Manager responsible for transforming Intel’s end user compute platform. Focusing on innovative methods of improving employee productivity while decreasing total cost of ownership. Tauben has over 20 years of experience in the domains of end user client computing, performance optimization, mobile connectivity, client virtualization and Cloud based services. 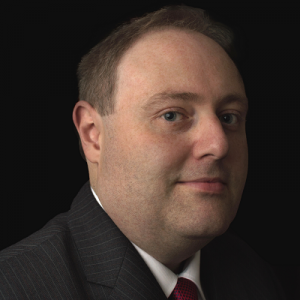 His roles have ranged from support through product management, program management and service leadership as well as expertise in vendor management, client analytics and business acumen.